Worth getting up early on a Saturday. 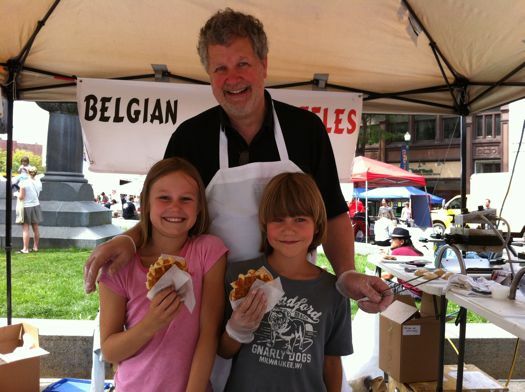 A couple of Saturdays ago, on a stroll through the Troy farmer's market, we tried our first LiÃ¨ge waffle. They're made fresh at the market by the people from Pika's Quiche. This past Saturday, the LiÃ¨ge waffles were calling to us before we opened our eyes. These are not the waffles you sit down to at breakfast -- the ones you cover in blueberries and maple syrup or whipped cream. Those are Brussels waffles. A Brussels waffle is a batter waffle that needs toppings because it's much fluffier and lighter (more on the different types of waffles). No, we didn't know this until Saturday, when we got an education in waffles from Luc Roels. He and his wife, Pika, are the owners of Pika's Quiche and the creators of said fabulous waffles (they grew up in Belgium). What Pika's makes are LiÃ¨ge waffles. They're not heavy, but they have substance. No knife and fork required -- you eat them on the go. 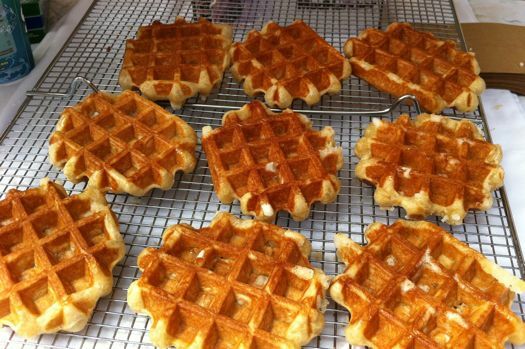 "A LiÃ¨ge waffle is considered to be street food in Belgium," says Luc. "People buy it, put it in a wrapper and you munch on it while you're walking around. 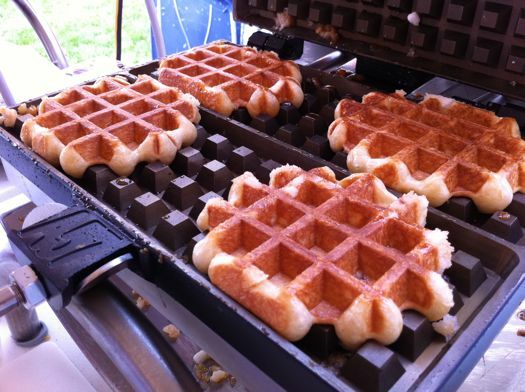 In Belgium people love it when they come straight out of the waffle iron." Ummm... not just in Belgium. So what makes these waffle so tasty? Luc says it's all in the ingredients. First, they're made with pearl sugar, which has to be imported from Belgium. The little sugar pearls make the waffle a little bit crunchy, and when you bite into a warm pearl of sugar, it sort of --pops-- a little. "It's like a chocolate chip cookie," says Luc, "but it's not chocolate -- it's chunks of sugar." The sugar caramelizes in the waffle iron but it doesn't melt so it stays together . "And when it caramelizes, it tastes soooo good," says Loic, Luc and Pika's son and waffle making assistant. He is not wrong. Other ingredients include eggs from Feather Ridge Farm and real butter. Luc and Pika were among the founders of the Farm to Table Co-Packers program. At their kitchen in Big Indian they try to keep ingredients local in all their products. "Flour is milled differently in this country -- it's milled finer here and butter has less butter fat in this country so you have to compensate for that and that's trial and error, trial and error, trial and error." "Ohhhh the trials..." sighs Luc's daughter, Pia -- another assistant waffle maker. "Every Sunday a different neighbor would come over to our house -- middle of winter here -- and we'd be like 'you wanna come and have breakfast?' And they'd have 4 or 5 waffles each and my dad is like trying a little bit of every waffle." The final recipe has a secret ingredient that surprised even Luc. "I always made the dough with buttermilk, and I was never quite there. You know? But all the recipes called for that. And then I found an old cookbook of my mom's and buttermilk was scratched out and she put in spatzen water, which means seltzer -- these have seltzer in them." So, where else can you get Pika's home made seltzer waffles around here? "Nowhere right now." Well, nowhere but the Troy Farmers' Market. Or at your own party. 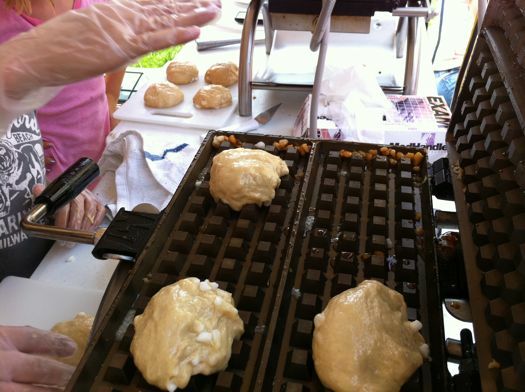 The folks from Pika's will bring their waffle stand to your party and make hot waffles for you there. That could take the sting out of a birthday. Luc says you can freeze the waffles and crisp them up in a toaster oven, but we're not sure it could compare with getting them right out of the iron. At $4 a waffle, you could get less expensive snacks, but munching a LiÃ¨ge waffle while wandering the farmers' market is well worth it. Have had these. They are delicious. Yeah... I need to try those. Will it be dry enough for Troy's market this weekend? I use seltzer in my kneidels (matzo balls). It's the secret to light and fluffy, rather than sinkers! OMG. Those waffles look heavenly. And I'm reading this right before lunch! Please come to the Schenectady Greenmarket too! 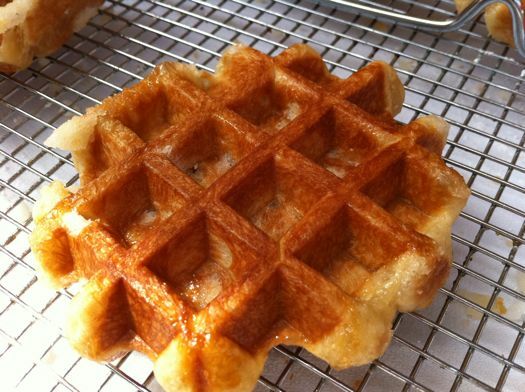 There are a few notable recipes around the interwebs for these waffles. 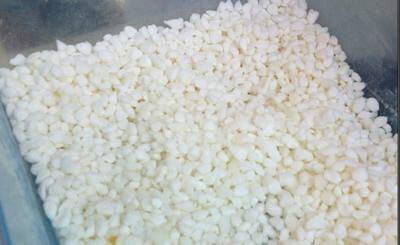 What there's not, however, is any recommended spot in the capital region to actually BUY pearl sugar. Does anyone have any tips? I've tried Hannaford, Price Chopper, Fresh Market and the Honest-Weight Food Co-op. Thanks! When I go to the farmers market, I almost always get one! I absolutely LOVE their waffles! I had to get one for breakfast every time I worked the Tight Knit market this summer. Super sweet & delicious! King Arthur Flour sells pearl sugar on their website and in their baker's store in Norwich.